Tap-Taps are small, spike-covered enemies that walk back and forth, first appearing in Super Mario World 2: Yoshi's Island and later in its remake, Yoshi's Island: Super Mario Advance 3. These enemies make a distinctive clicking noise while they walk. 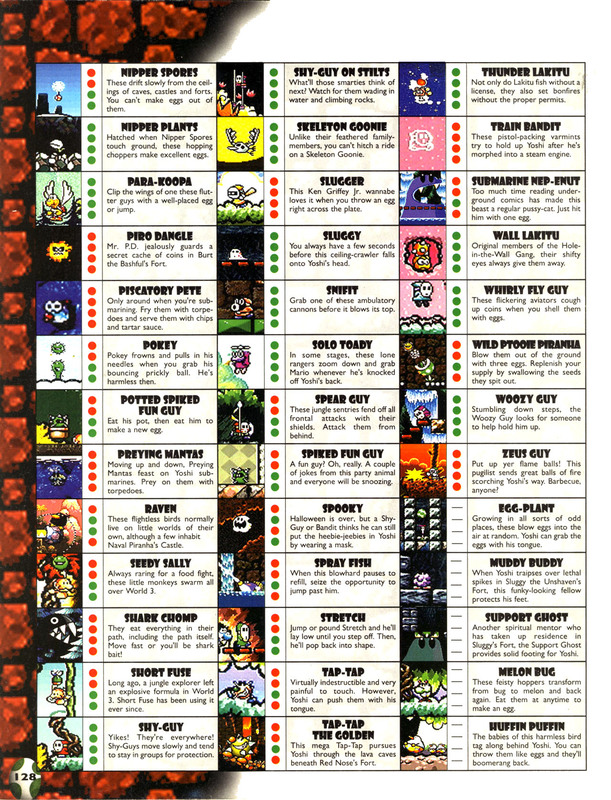 Sometimes, they are found hopping up and down; these variants are specified as Hopping Tap-Taps in the Player's Guide. Tap-Taps are immune to most direct attacks; if Yoshi attempts to eat a Tap-Tap, he will only push the enemy slightly with his tongue. 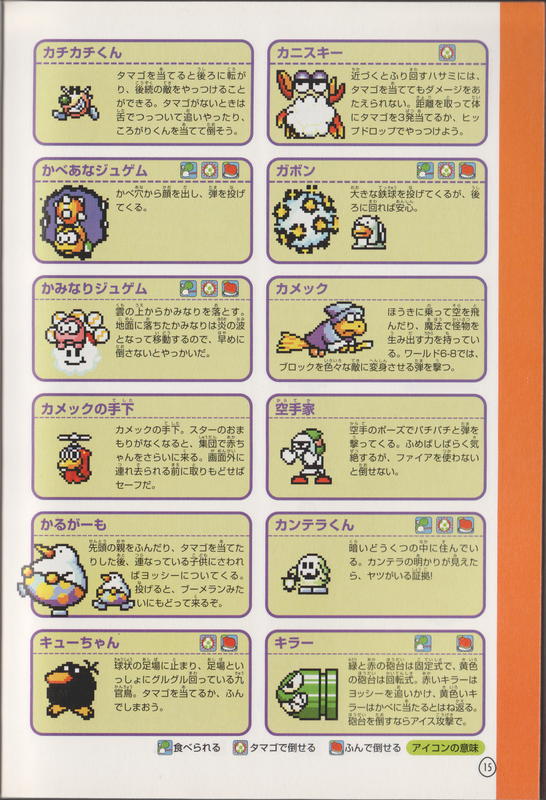 The enemy is also resistant to Yoshi Eggs and Huffin Puffin chicks, although they will be sent rolling backwards if hit with one. To defeat a Tap-Tap, it has to collide with another enemy while rolling. Chomp Rocks, ice breath and fire breath attacks are also capable of defeating a Tap-Tap. There are two color variations seen in Tap-Taps; gray ones remains on their platform, while orange ones walk off the platform they are on. This difference in behavior is also seen in green and red Koopa Troopas. A Tap-Tap is encountered as a mid-boss in Super Mario World 2: Yoshi's Island as Tap-Tap the Red Nose. 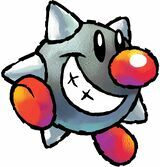 A similar enemy is later encountered in Baby Bowser's castle, known as Tap-Tap the Golden. 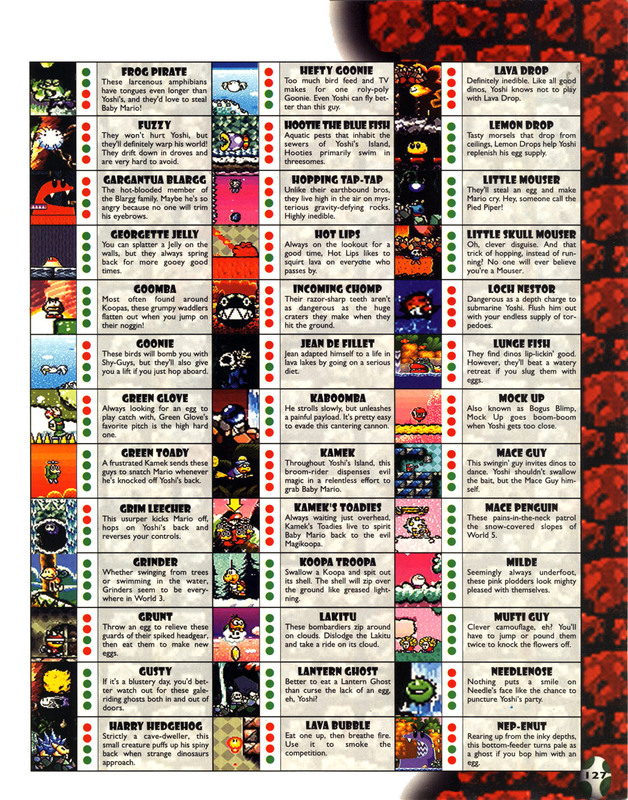 Tap-Taps also appear in Yoshi Topsy-Turvy, Yoshi Touch & Go (whose manual erroneously labels them as Spiked Fun Guys, which are actually a different species), and Yoshi's Island DS, where they remain unchanged from previously. A large, invulnerable variation (with the ability to crush land platforms) known as the Super Big Tap-Tap also appears in Yoshi's Island DS. Tap-Taps return in Yoshi's Woolly World and Poochy & Yoshi's Woolly World. Their bodies now consist of a brown baseball with pointy beads, functioning as spikes. As in previous appearances, some Tap-Taps walk back and forth between two walls, while other jump up and down in place. In Super Smash Bros. Ultimate, a Tap-Tap appears as a Spirit. Kachikachi-kun Japanese onomatopoeia for stones knocking together to create fire. Spanish Rolando Pun of a Spanish name and its literal translation, rolling. Italian Piombospino From piombo, lead; and spina, spike. This page was last edited on April 3, 2019, at 08:06.